You are currently browsing the Carpe DMM blog archives for November, 2015. We are sitting on our flight from Boston to Dallas, taxiing to take off an hour late. It looks unlikely that we will make our connecting flight, and will probably have to spend a full day in Dallas. To make matters worse for our chances, we are seated in the very last row of the plane and will be the last people to get off. 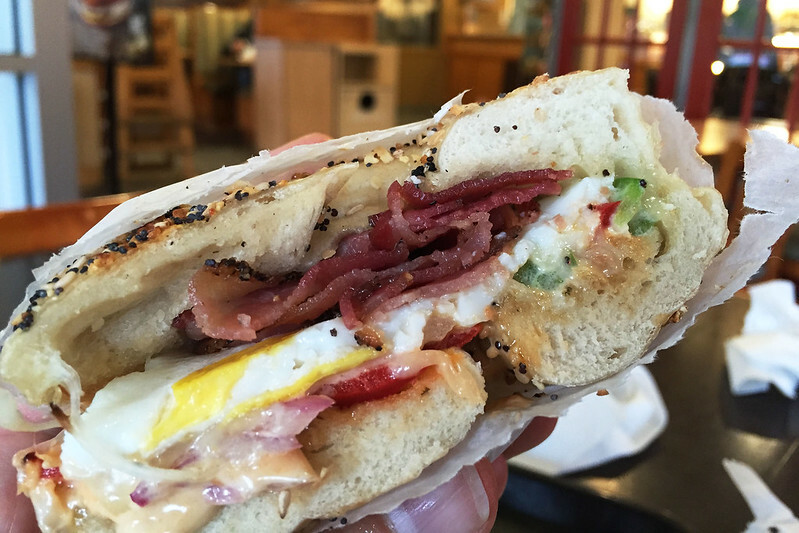 Breakfast bagel at Bruegger’s Bagels, Brookline, Boston. Brilliant! We slept in a little this morning, then got up and went to Bruegger’s for a bagel breakfast again. M. had a whole wheat bagel with a thin scrape of peanut butter on it. I tried the south-west breakfast bagel, which had egg, cheese, peppers, and a chipotle sauce. When we emerged from the hotel, expecting a warm day similar to yesterday, we were shocked to find it raining and cold. I went back in to get my umbrella and jacket, though M. declined to get her jacket. 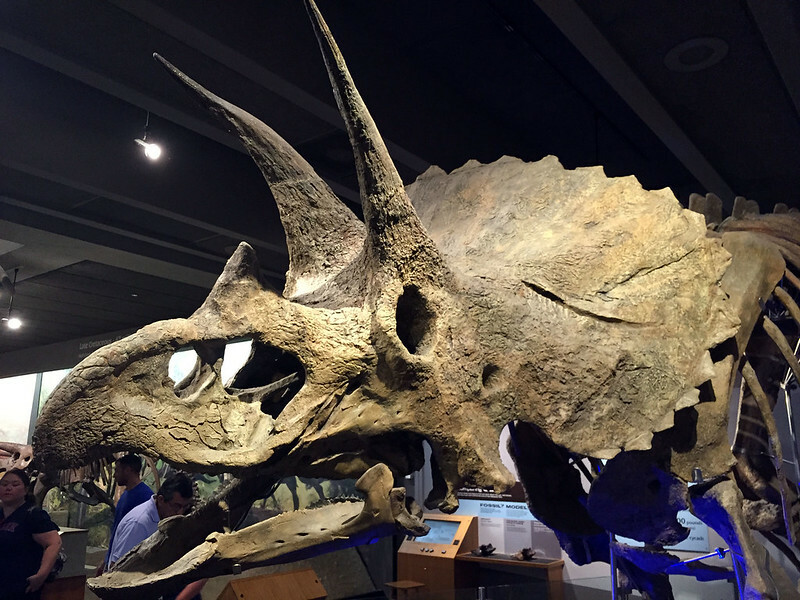 Read more: We visit the Museum of Fine Arts before heading to the airport for our long flight home. We slept in this morning. Although I woke and was restless from about 03:30, I think I must have fallen asleep again around 05:00, because the next thing I knew it was close to 08:30. It took a day of not having to get up early to let me sleep more. It’s a shame today is our last full day in Boston! We got some change from the front desk for my T ride this morning, as my weekly pass ticket had expired. Then we went to Bruegger’s to get bagels for breakfast again. M. had a pumpernickel with a bit of cream cheese, while I tried the “everything” bagel with smoked salmon cream cheese. It was really good, though a touch salty in places from the salt crystals used as part of the coating. From there we caught the train in to Arlington station, where we exited to walk to the South End Open Market at SoWa (“south of Washington”). This was a fair walk, and the day had begun warm already, but at least it was partly cloudy. This didn’t help much once we arrived, as the stalls were in a very exposed area and the sun beat heavily through gaps in the patchy cloud as we walked around. We ended up a bit reddened by the sun by the end of the day, but fortunately not to the point of painful burns. 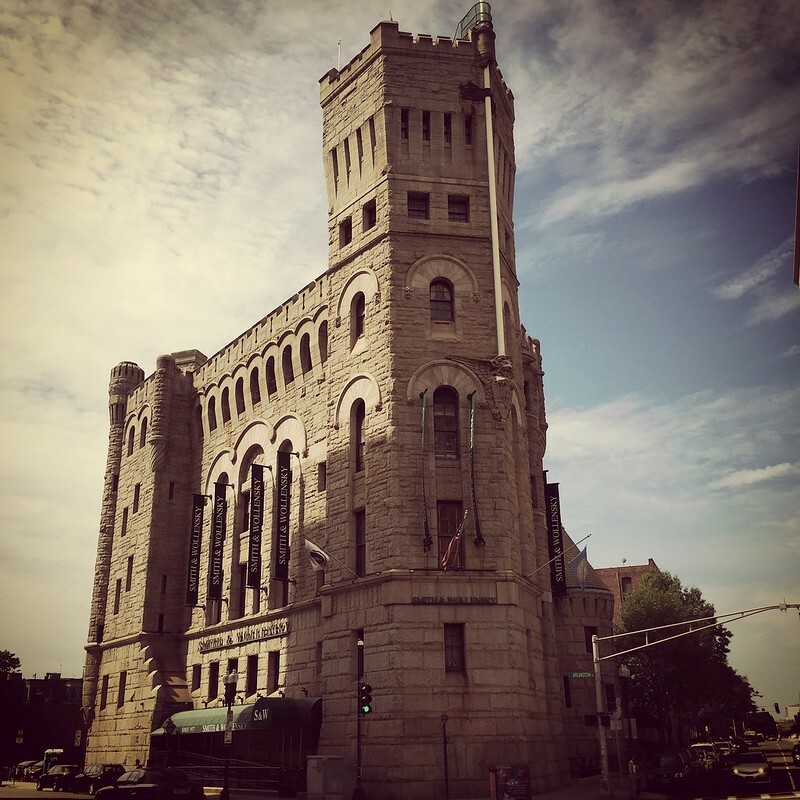 Read more: A day at the market, lunch from a food truck, walking through Boston’s South End, afternoon tea at a French bakery, and fancy dinner for our last night in Boston. We are on the ferry from Provincetown to Boston, after spending a full day over here at the tip of Cape Cod. We got up early at 06:30 and quickly left the hotel to get some breakfast at Bruegger’s Bagels. M. had a pumpernickel bagel with peanut butter, while I had one with egg, cheese, and ham, which was pretty good. Then we got M. a coffee from Starbucks and went to the station to catch a train in to Park Street. There we changed to the red line for two stops to South Station, and then changed again to the silver line buses to take us out to World Trade Center, where the ferry wharf was located. I’d calculated a maximal trip time if we had bad connections to make sure we got there in time, but we had very good connections at each place, so arrived with plenty of time to spare. We wandered over to the waterfront and located the ferry ticket office, where we picked up the tickets I’d bought last night. There was already a queue of people waiting to board the ferry, but there was so much time left that we took a walk out to the end of the wharf to see the view, before returning and joining the queue. More people arrived and the queue quickly doubled in length or more behind us. Lots of people had large luggage, much of it still labelled with airport tags. 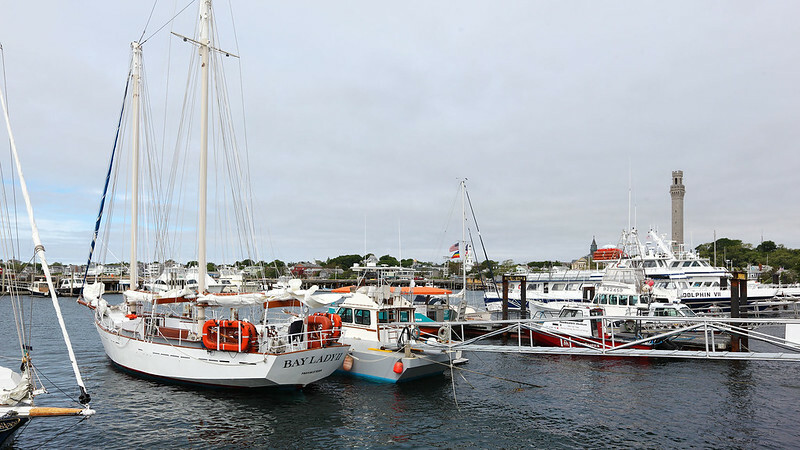 Read more: A lot more… it was a busy day in Provincetown, shopping, eating, drinking, looking at the sights. I had yet another lousy sleep. But it was up again and dressed to go shortly after 07:00 for my last breakfast at the conference. There were bagels, fresh fruit, and different types of breakfast cereals. I had an onion bagel with some cream cheese, and a lot of fruit. Today’s conference sessions were workshops on specific topics, held in small rooms, with several different topics in parallel. I attended a morning session on “Vision meets Cognition”, about the various similarities and differences between computer vision algorithms and a psychophysical understanding of what happens in our vision and brain systems, and how we can learn to adapt how our minds interpret vision to produce better computer algorithms. The speakers were quite entertaining, but this was more a general overview of the topic than any specific new work. I left to meet Elena at 12:00 at a Thai place called Bangkok Blue. We hadn’t seen each other for over 20 years, so there was a lot to catch up on. She had a tofu noodle dish, while I tried the special of the day, which was curly yellow egg noodles in a broth of coconut milk and spices, with chicken pieces. It was really delicious. After lunch, we walked back to her work at Emerson College. 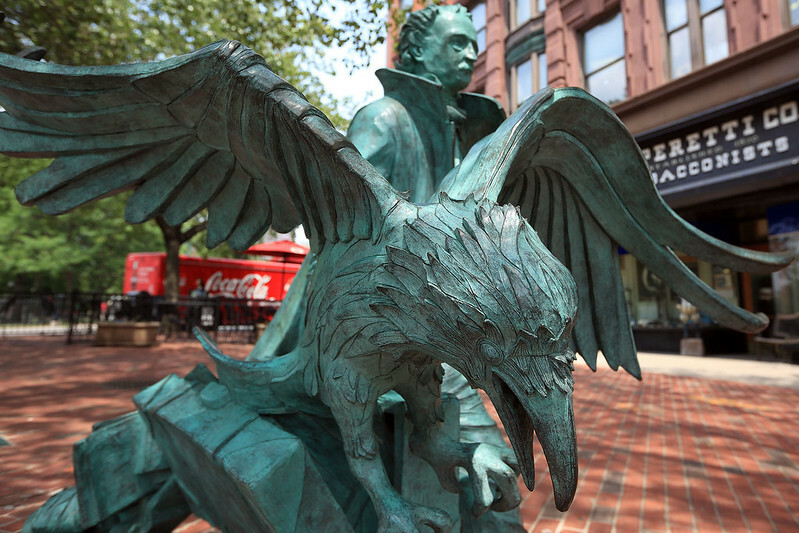 We passed the Edgar Allan Poe statue and I took some photos. The we said bye, having arranged to meet tomorrow morning with her daughter and M. at 09:00 at Park Street station to have a day out together. Read more: I walk across the Charles River to MIT and the Canon medical imaging research centre, and have dinner at a good Mexican place. I had another restless night. I finally got up just before 07:00 and did some stretches before getting dressed to leave for the conference. Breakfast there this morning was hot porridge with add your own brown sugar, flaked almonds, and mixed berries. I left the sugar out. There were also bacon and egg rolls on “pretzel buns”, whatever they are, and turkey biscuit sandwich things, neither of which I touched. I want to avoid anything too unhealthy and eating too much rich food while away from home, as it’s far too easy to do if you’re not careful. 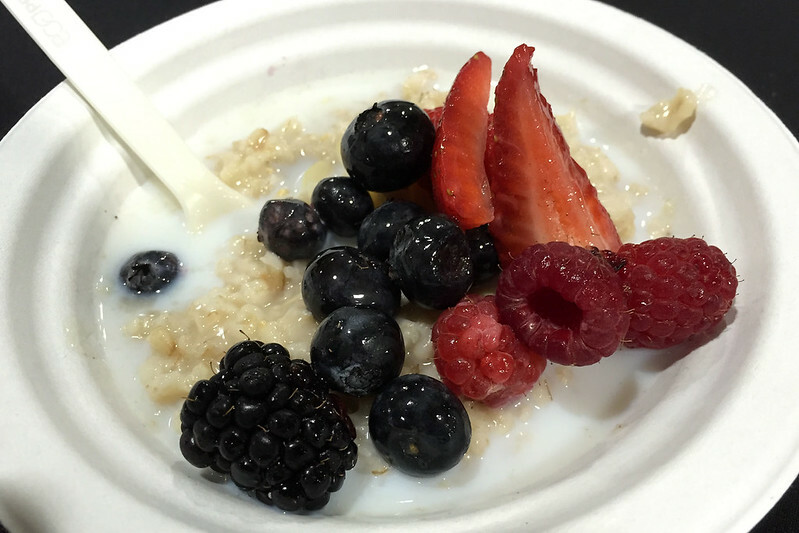 Porridge and berries at the conference. The morning session had some interesting talks for me, related to my work, so that was cool. The lunch today was pasta and antipasto, with Caesar salad. There were two types of pasta: a rolled ball of spaghetti so you could pick up a ball in the tongs, with pesto sauce I think, and cheese tortellini in a creamy sauce. I had a few of the latter, but mostly filled up on the salad and the antipasto, which was marinated mushrooms, grilled red capsicum, and cannelini beans in a pesto sauce. There were hot chicken pieces as well, but I didn’t take any meat. There were also the huge chocolate chip cookies again, but I avoided those too. Read more: Mostly about dinner – pizza and ice cream! I slept poorly again, and got up before 07:00 to get dressed and leave for the conference in time for breakfast. Today it was scrambled eggs, which were decently good, as well as yoghurt, fresh fruit, and muffin tops in various flavours. I’ve never seen muffin tops before – interesting concept. Farmer’s market at Copley Square. For lunch today I met M. at the corner of Newbury and Dartmouth Streets, as she spent the day going through the shops on Newbury. 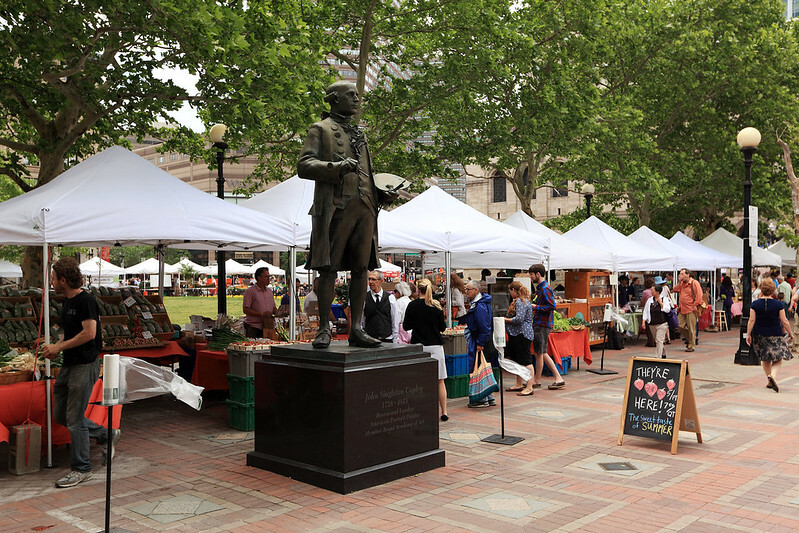 We walked over to Copley Square, where there was a small farmers’ market, which Elena had told me was there every Tuesday. We perused the stalls before buying a couple of sandwiches for lunch form a bakery stall. M. selected a mozzarella and tomato one on a baguette, while I picked a tomato and artichoke on sliced light rye or something similar. We found a seat on the square in the shade of trees. M. looked at the sandwiches and decided that she liked the look of the artichoke one better, so we swapped. The mozzarella was fresh and creamy, and it looked like whole balls of it had been stuffed into the baguette, which was soft in the middle with a crispy crust – it was really good. M. also had a tiny cranberry and walnut bread roll, but gave me some of her sandwich, which was also good. Read more: We tour the interior or Trinity Church, go to an Irish pub for dinner, and have a close encounter with a mouse in our hotel room! I slept until about 04:00, when I woke up and couldn’t fall asleep again. M. slept right through to 06:30 when I got up and started getting ready to go to the conference centre. Since they’re supplying breakfast, I wanted to be there in time for it. Today there was hot porridge and pastries and boiled eggs, replacing the bagels and babkas of yesterday. There was still fresh fruit and yoghurt. 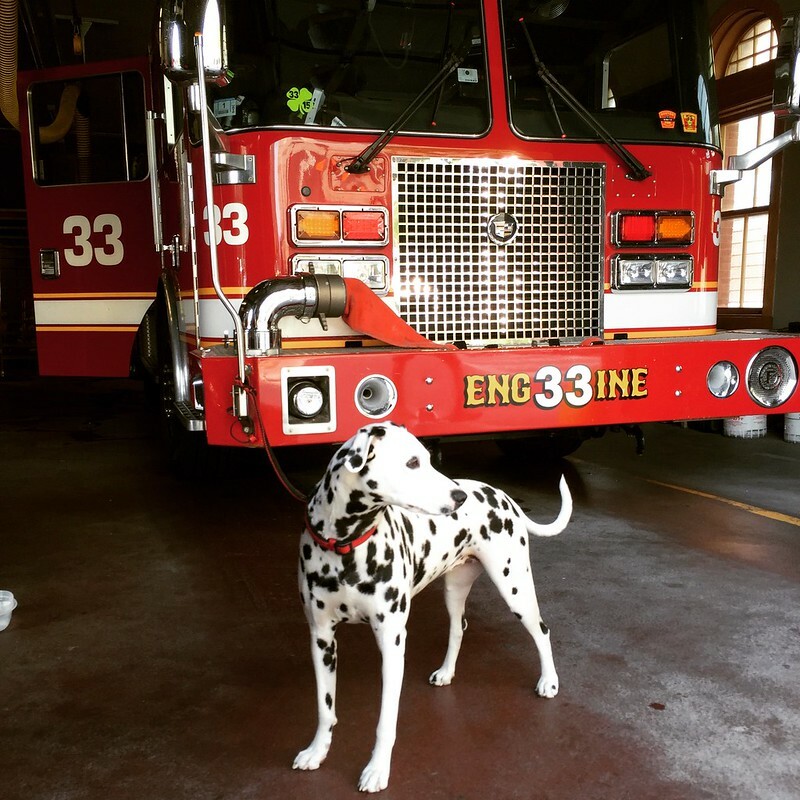 Fire station dog, near the convention centre. While I was at the conference M. spent the day walking around the downtown area, checking out Quincy Market, Macy’s, and various other things around there. She said she ended up in Chinatown at one point, having underestimated the distance she needed to walk and overshooting by a few blocks. She came back to the hotel room about 16:30, then headed out to a bakery which reception had given her the address of. Read more: The corporate exhibitors and demos at CVPR, hand made pasta for dinner, and then fancy ice cream! I am sitting at Boston airport again, waiting for M.’s flight from Dallas to arrive. I slept through from 22:00 last night until 05:00 this morning, but was awake from then. Still, not too bad for the first night’s sleep after a 13 hour time shift. I had some dry Weetabix which I’d bought last night from Trader Joe’s near the Mexican place. I didn’t get any milk or yoghurt for it since the room doesn’t have a fridge to keep it cold. I dressed and caught the train to the Hynes Convention Centre, where the Computer Vision and Pattern Recognition (CVPR) conference is being held. It turns out they had breakfast supplied there! They had bagels, babkas, and fruit. After waiting in a queue for about 10 minutes to collect my registration package I grabbed a bagel and some fruit. 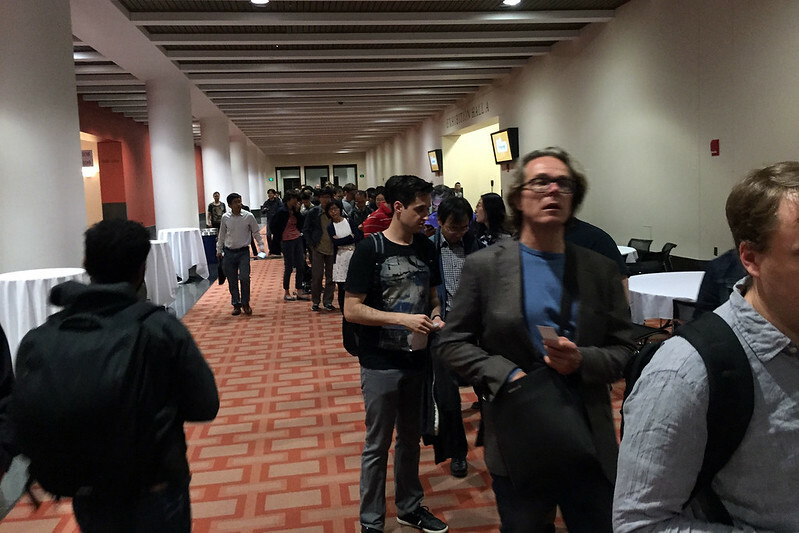 Registration queue at CVPR conference. I ran into Peter who recently left CISRA, and also Anthony who is still working there, both within a minute of each other. I had no idea either of them would be here! I went to a morning tutorial session on computer vision applied to cinema. It was presented by five guys who worked on various aspects of applying computer vision methods to cinema production. Read more: My first day at the conference, taking a walk to Copley Square at lunch, picking up M. at the airport, and Thai food for dinner.